Markets were fairly weak yesterday as attention continues to focus on the European Summit, and whether the powers that be can agree on a plan to address the Continent’s debt crisis. Key European indices the DAX and CAC were both down 0.37% while the FTSE was off by 0.56%. The DOW and S&P meanwhile rebounded from significant intraday losses, and into the close were down just 0.2%. US markets took some heart from the Supreme Court’s decision to uphold a key part of President Obama’s health care overhaul. Also some degree of optimism emerged that EU leaders were making headway. Much of the world is looking at Brussels with a two day summit underway. Adding to the air of trepidation is that German Chancellor Angela Merkel has openly talked about focussing on fundamental reforms rather than emergency rescue proposals put forward by Spain and Italy. This could be seen as Italian bond yields spiked to 6 month highs. What will be key for investors is just how hard Germany’s line is on this, and whether some leeway is given if progress is made on reforms and budget controls. Encouragingly, we have had some positive signs here in recent hours, with EU President Herman Van Rompuy announcing that a plan to spend 120 billion euros to stimulate growth has been agreed. EU leaders have also agreed to up the capital of the European Investment Bank by 10 billion euros. With the growth plan agreed, the stickier part will be addressing Spain and Italy’s pleas. As we have stated throughout the Daily Fat’s this week, if the summit does not deliver at least a high-level agreement on greater fiscal and financial integration across the euro area, we can expect more volatility across the markets. Although for now it continues to surprise how markets have held up under prevailing pessimism. And although we saw the VIX spike above 21 overnight, it again has settled back under 20. 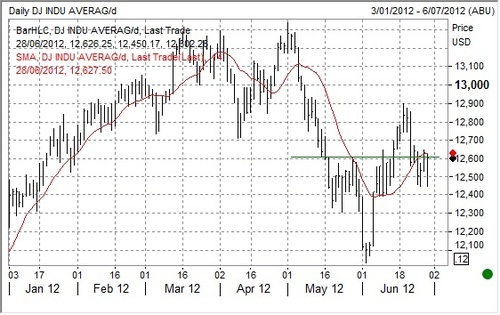 US markets rebounded from their lows after the Supreme Court upheld a key part of President Obama’s healthcare reforms. The decision to leave the individual health insurance requirement was seem as something of a victory for Democrats and Obama. The reforms could see another $2 trillion spend on healthcare, which would ultimately be a fillip for the economy. Elsewhere economic data today was somewhat benign. US GDP is still coming in at a 1.9 percent annual growth rate, and weekly jobless claims fell 6,000 to 386,000. We noted that the banks and financials were again in focus today, with JP Morgan leading centre stage, The New York Times speculated that losses from the company’s derivatives trades may reach $9 billion. The sector was off as a result but we continue to believe (like a certain Mr Buffett) that the US banks remain attractive on an earnings basis, and are in a better position capital wise than Continental Europe counterparts. Specifically, we continue to be positive on Wells Fargo, and Citibank which are held in our US portfolio. UK banks meanwhile remain under pressure. Today we saw Barclays’ shares (not a stock we hold) under pressure. Britain’s second biggest bank fell heavily after it received a record $450 million fine for falsifying London interbank offered rate submissions, with investors speculating lawsuits will follow. 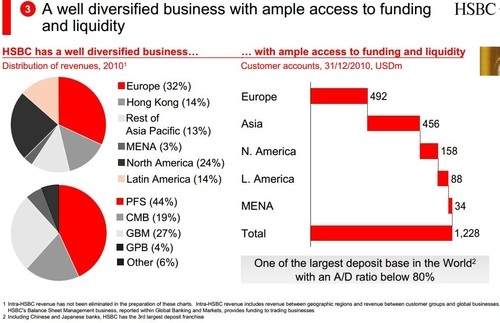 In terms of UK listed banks we continue to favour HSBC, which has held up well on the back of being one of the most diversified of all the global banks (as the below diagrams illustrate). We put a buy on the stock again in last night’s UK Equity report. Overall there is no doubt that stock markets are feeling a degree of pressure at the moment. One thing that is becoming readily apparent amidst recently volatility is that the cream is rising to the top, with the share prices of companies that are performing well are holding up. With the prospect of not being able to rely on a ‘rising tide to lift all boats’, this reinforces the importance of stock selection in our view. We have seen a number of stocks in our portfolios hold up well – including the likes of United Utilities, Rexam, Marston’s and Playtech. It remains key in our view to be even more disciplined in volatile markets, and we will continue to seek out the value at the large and small end of the market. On Monday we reported on the surprise collapse in the Philadelphia Fed Index (The Philly) for June. An outcome that suggested the Fed would need to act on a quantitative easing (QE) soon rather than later. The release of the US Durable Goods Orders for May surprised on the positive side and has swung the US manufacturing picture around and with it alleviating any need for an urgent QE intervention. Or has it? Consensus for May New Orders was for a plus 0.4% improvement with a range of negative 1.0% to positive 1.0%. The May outcome for New Orders was 1.1%, compared to 0.2% for the month of April. Annually, New Orders continued to weaken with May’s year-on-year figure softening to plus 4.6%, compared to plus 6.9% for April. The transport sector was the big contributor to the stronger than expected May outcome. The transport component jumped 2.7%, which was noticeably stronger than the plus 0.8% for April. Within the sector nondefense aircraft advanced 4.9% for May compared to plus 0.1% in April. Defence aircraft was also strong turning positive in May at plus 6.9% compared to the negative 36.1% for April. The momentum in the auto sector continued with a rise of 0.5% for May following a strong rise in April of plus 5.7%. Outside the strong transport sector other sectors that showed strength in May were the machinery and electrical sectors. Not surprising was primary metals that weakened in May, as did fabricated metals. Less so was the weak performance of the computers and electronics sectors. We expect the Fed will be watching the annual Durable Goods Order trend very closely, although punctuated with upward movements it is still weakening and has been for many months. This trend is recurring despite the QE initiatives implemented by the FED to date. Importantly, the Philly is a forward looking survey and we know what the June figure came in at negative 16.0, surprising on the negative side and well below the low end range of consensus. 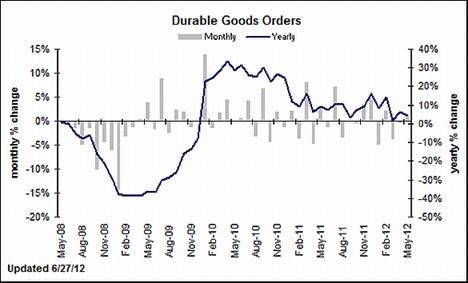 The broader US economic picture may look muddling as a result of the May Durable Goods Orders outcome. However, stepping back and looking at the annual trend and the June Philly result and the QE doctor may be champing at the bit to get out. As we have said before, it is likely a case of ‘when’ rather than ‘if’. The Qataris appear to have cannily called Glasenberg’s bluff with their eleventh-hour demand for changes to the terms of Glencore’s offer for Xstrata. From the outset, the offer has been unpopular and viewed as cheap, opportunistic and rather arrogant – exploiting the absence of any likely counter-offer due to Glencore already owning over one third of Xstrata. Since the bid was announced in February, Ivan Glasenberg of Glencore, and Xstrata’s Mick Davis had embarked on a charm offensive of over 300 shareholders; and it appeared the audacious low-ball bid might have just got over the line…until last month’s proposed £170m “retention bonus” for 73 “key” Xstrata executives (including Davis’ £29m over three years). This move was ill-judged and ill-timed in an environment of austerity and increasing shareholder activism against executive greed: it was the straw the broke the camel’s back. Since the bid was announced, the Qataris had been quietly adding to their stake, which now stands at just over 10%. Their announcement on Tuesday evening was a lightning rod for the many other dissenting and frustrated shareholders, and it suddenly certain the 16.5% required to kill the proposal at the vote on July 12thwould be reached. We are not overly surprised and indeed the rebellion is a bold statement, moreso given recent market volatility. 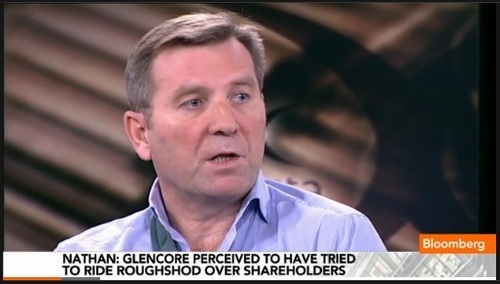 Glencore is opportunistically looking to walk away with one of the world’s diversified miners for a bargain, and it knows it. In response Glencore withdrew the offer – ahead of today’s deadline – and true to form is talking tough and threatening to walk away; while also now agreeing to targets for the 73 lucky and indispensable Xstrata senior executives to meet in order to earn their bonuses. Interestingly the Qataris appear unfazed by these threats, and maintain they see the intrinsic value in Xstrata…. It is believed the 3.25:1 ratio now demanded – or 16% more than the 2.8:1 proposed – is unlikely, but the 3:1 compromise long sought (and hitherto stubbornly resisted) by shareholders is the likely outcome. Another possible outcome could be a sacrificial lamb in the form of Xstrata chairman Sir John Bond, whose handling of the tie-up is viewed as unedifying – particularly the refusal to separate the vote on remuneration from the merger and lack of consultation with shareholders. Some still want two separate resolutions on pay and the merger. So who says the monarchy does little for the UK? As official statistics confirm the UK’s double dip recession, news that UK retail sales rose at the fastest pace for 18 months in June lightened the mood. The reason? Brits braved the weather and splashed out for the Queen’s Diamond Jubilee celebrations (earlier this month) which provided the high street with a much needed shot in the arm. Retail records were broken from all angles – grocers recorded their strongest sales growth since February 2010 whilst shoe and leather retailers reported the strongest sales growth on record. In a recent report by Brand Finance, a brand valuation consultancy, a valuation of £44.5 billion was attributed on the monarchy underlining the importance of the Royal family to the UK economy. If listed, the Royal family would be mixing with the big boys on the FTSE 100. The valuation includes £18.1 billion of assets including the crown jewels and royal palaces. In addition to those tangible assets, the monarchy is estimated to be worth an additional £26.4 billion because of the economic benefits it brings to the UK, via the boost to tourism and other industries. There has been much question over whether the additional bank holiday in celebration of the Queen’s Jubilee anniversary would hinder the UK’s attempt to climb out of recession. Whilst many the lost working hours will reduce productivity, on the flip slide it is important to note the contribution of the Royal family to tourism is estimated to be around £500 million each year. We for ones are fans and look forward to events such as last year’s Royal Wedding and this year’s Diamond Jubilee. They play a major role in the UK economy and become even more pivotal during times of austerity. Like all big sporting events, the Olympics is very big business for the television networks. But despite the ‘citius, altius, fortius’ nature of the price tag for the broadcasting rights for successive Olympic Games, the commercial television networks across the world have always struggled to make money on the two-week event. Advertisers are always happy to be associated with the Games, but the host broadcaster never seems to be able to generate sufficient revenue to cover the cost of the broadcasting rights. TV Networks argue that the halo effect of being the host broadcaster justifies the cost, but we have yet to see any firm evidence that being a host broadcaster is a profitable exercise in its own right. A secondary but nonetheless important factor is the time difference between the Games host and the host nation’s prime time audience schedule. If the key events do not coincide, then the broadcaster cannot charge enough money for the advertising. So it is with great interest that NBC Universal, a subsidiary of US cable operator Comcast, has made a proud boast that the US$4.38 billion it has forked out for the next 4 Olympic Games (summer and winter to 2020) will be a profitable exercise. NBC is expecting an audience of 200 million to watch its coverage of the London Olympics even though the time zone does not suit its American audience. NBC is hoping that replicating the success of its Beijing online coverage, when 53 million events were streamed, will boost its audience and revenue. NBC is upping its total broadcast coverage to 3,500 hours on the internet with as many as 40 feeds at any one time. The limited capacity of the commercial network single channel model is the bottleneck for NBC. But as NBC is now part of the largest US cable company, Comcast, it now has the channel capacity to feed the games to its customers.